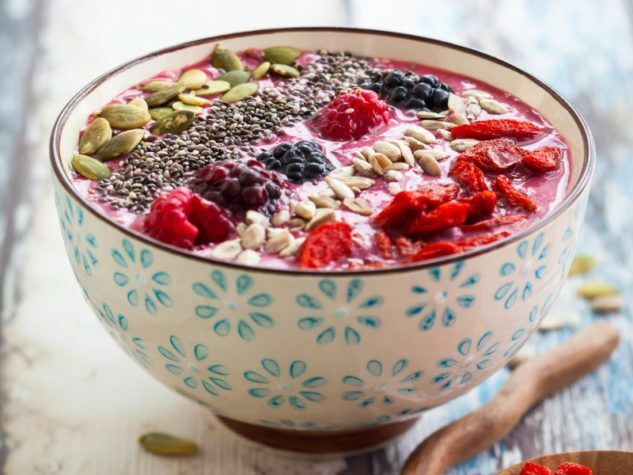 Breakfast berry smoothie bowl topped with goji berries,raspberry, blackberry, pumpkin, sunflower and chia seeds. In recent years, goji berries have become increasingly popular in the West, where they are presented as the latest “superfood”. Notwithstanding some well orchestrated marketing, to date no reliable clinical trial have confirmed the benefits of these berries on health, even though it has been confirmed that they are rich in antioxidants. And yet goji berries have been used for a very long time in traditional Chinese medicine for their anti-aging properties and healing powers. The goji is a small fruit, also known as wolfberry, and is native to Tibet, where it is also known as “the laughing berry”. Its shape is similar to an elongated cherry with a slightly sweet flavor. Goji is actually the trade name given in 1973 by a Canadian botanist who tried to reproduce the Chinese pronunciation of gǒu qǐ. In natural food stores or specialty online stores, gogi berries are available as juice, dried berries or as a powder. China is by far the largest producer, but some farmers are beginning to grow in the United States, Canada and France. If you are interested in trying gogi berries, I suggest you try the dried berries, which you can then add to a bowl of cereal, in yogurt, on a fruit salad or on a lettuce salad. But remember that no one food alone can work miracles and we already have access to a wide variety of healthy berries, many of which have clinically proven beneficial properties and high antioxidant value, such as blueberries, cranberries, strawberries and raspberries.